The neighboring cities of Bend and Sunriver in Central Oregon draw millions of visitors each year for its sunshine, high desert climate, relaxed, artsy atmosphere, and countless recreational opportunities. 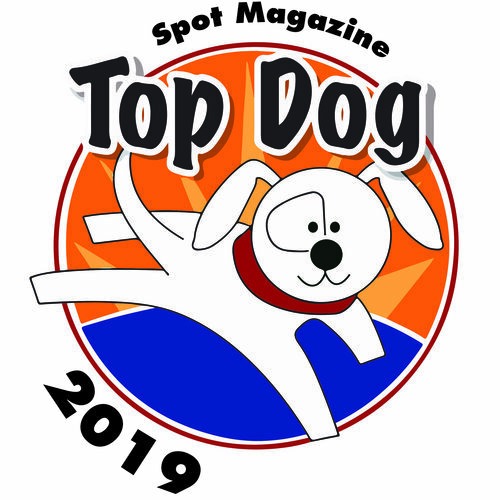 For dog lovers the region also wins praise for canine accommodation with, plenty of lodging options, more than 50 miles of urban trails, 13 off-leash parks, and abundant swimming holes just right for pleasurable pawed splashing. If you’re planning a trip in August, consider attending Ruff Run Aug. 18, a benefit for the nonprofit DogPac, which supports off-leash winter and summer trails. Bend and Sunriver both have excellent dining, from relaxing patio venues to well-heeled settings ideal for kicking off a night on the town. Dogs are welcome at more than 40 restaurants, including (in Bend) The Lodge and Red Dog Depots of the Cascade Lakes Brewing Company franchise, Anthony’s, the South Bend Bistro, Café Sintra, and the Aloha Café. In Sunriver, your pooch can hang with you at the Village Bar and Grill and Marcello’s. For a full list of dog-friendly dining, check out VisitBend.com. It’s all about the play here, and much of it can center on getting the pups dog tired. Favorite dog-friendly parks include Drake Park, with adjacent Mirror Pond for jumping and swimming, Big Sky dog park, Riverbend Beach (which includes a fenced area for the small dogs), and the Awbrey reservoir. Several trails within the Shevlin Park and Deschutes River areas have excellent hiking and river access for cooling off in hot summer months. Learn more about off-leash areas at DogPac.org. If you’d like to take the pooch on a river adventure, the Tumalo Creek Canoe and Kayak Company welcomes dogs, and even offers Ruff Wear PFDs to keep them safe on the water. More than 200 independent shops invite visitors to browse for local crafts, quilts and fabrics, specialty foods, wines and antiques. In Sunriver, be sure to stop by Sunriver Books and Music and visit with Flashman, the resident Boxer and “pride and joy” of the company. If you’re looking for a treat for fido, or just want to pick up a new dog bed or food, Bend Pet Express and Sebastian’s Healthy Pet Food are at your service. Pet-friendly lodging in Bend and Sunriver abounds, particularly when it comes to home away from home comfort. Family owned and operated Bennington Properties goes the extra mile for furkids. Sunriver Resort maintains more than 70 pet-friendly accommodations, including private cabins, guestrooms and suites. Other pet-friendly properties include the Riverhouse Resort, and a range of economy lodgings including La Quinta, Days Inn and Econo Lodge.